We believe if we join together in prayer – intentional prayer – that God will show up in our lives in amazing ways! During this series, as we pray together as a church for 40 days, you will learn how to cultivate a powerful prayer life, no matter what obstacles you face. We will encourage each other to pray with our friends, coworkers, families, and neighbors every chance that we can get. Don’t miss a week of this series! During the 40 Days of Prayer, our hope is that your prayer life will grow richer and more meaningful. We’ve provided two resources to help you in this journey. The prayer journal and workbook focuses on your prayer relationship with God. Our goal is that you take your prayer life to a deeper level. For some this might mean starting to pray more regularly, for others it might mean praying more intentionally. But for both it would be praying more to the God who hears and answers prayer. It will help you grow the intimacy of your prayer relationship with God. 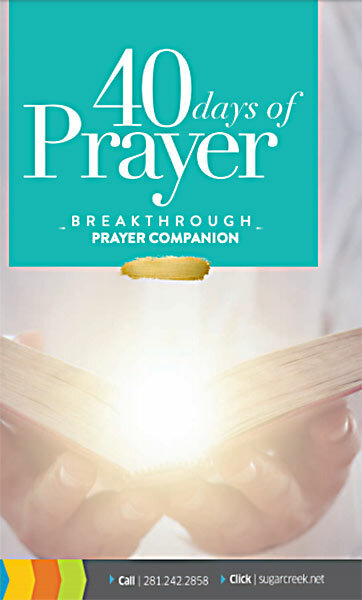 The companion prayer guide focuses our hearts, not on us and our needs but on the Kingdom of God. When we pray to God about His Kingdom, we leave our prayer time having experienced who He is, not waiting to see what He will do. This experience allows us to have confidence in God our Father, creating breakthrough in our lives. Did you know every significant spiritual movement in history began with people gathering in groups to pray? It’s true! Over the next several weeks, we invite you to join us as we intentionally seek God in prayer, together! Below are 10 easy ways to invite others to pray with you. As a whole church, we are praying for revival. We are praying for a breakout of the power of God among us. What would happen if our church spent 40 days praying together? What would happen if our church spent 40 days learning how to pray and really connect with God? What would happen if God cleaned our hearts and energized us as a church with His Holy Spirit? This is exactly what happened at Pentecost when the church prayed for 40 days. It is exactly how the Great Awakenings in America and others parts of the world have happened in days gone by. We are asking for God to bring us spiritual renewal as a church and to do it through prayer. We want our children, our teenagers, our adults and our families to learn how to pray…and to pray together. We are wanting a “million” groups to form organically throughout our church family meeting just to pray. What change would happen to you? To your family? To our church? To our region? This message begins our 40 Days of Prayer. When is your prayer huddle meeting? I agree to Sugar Creek collecting my name for program. Find a friend that will pray with you as you walk your neighborhood. With every house you pass, pray that each family will know the grace and truth of Jesus Christ. Pick one meal a week where everyone can sit down together. Let each person take turns praying for a different family member. Do you live near your extended family? If so, one of the best ways to keep these relationships strong is to gather together and pray for one another. Start each morning or end each day by praying for each other and your family. Pick a day during the week to eat lunch in the office. Use this time to eat and pray for your company, coworkers, and customers. Invite your coworkers to join you and see how God blesses your team! During your commute, ask how you can pray for your fellow car-poolers and invite them to join you too. PRAY WITH OTHER SCHOOL PARENTS. Invite other parents to pray with you in front of the school each morning. PRAY WITH OTHER TEAM PARENTS. While your kids are practicing/playing, find a few other parents who will join you to pray for the team, the coaches and their season. Gather your closest friends for a meal each week, or take dinner club to a whole new level by praying together as you eat. PRAY WITH A CONNECT GROUP. Join an existing Connect Group at Sugar Creek and participate in the 40 Days of Prayer Connect Group Study! ASK GOD WHO YOU SHOULD PRAY WITH! There might be another group or person you need to pray with that we didn’t think of. Ask GOD to inspire your imagination. Are you getting together with friends to pray? We are excited you are getting with a group with your friends to pray. Let us know if you are or if you have a story to share how God is moving through prayer in your life or your group.